“Today we’re going to talk about reproduction….” to a class full of sniggering schoolboys who are tossing a plastic cross-section of the female reproductive system around the lab. And that was at a grammar school. If that rings true for you, you might not have learnt a whole lot in science class. I know I didn’t. I was an A-grade student the rest of the time, but science? Meh. I just wasn’t feeling it. However, now I’m a forty-something skincare salesperson extraordinaire and self-confessed beauty product junkie, I wish I’d sat up straight and paid attention during the periodic table recitals and mind-blowing molecular structure sessions; skincare has got so…scientific. 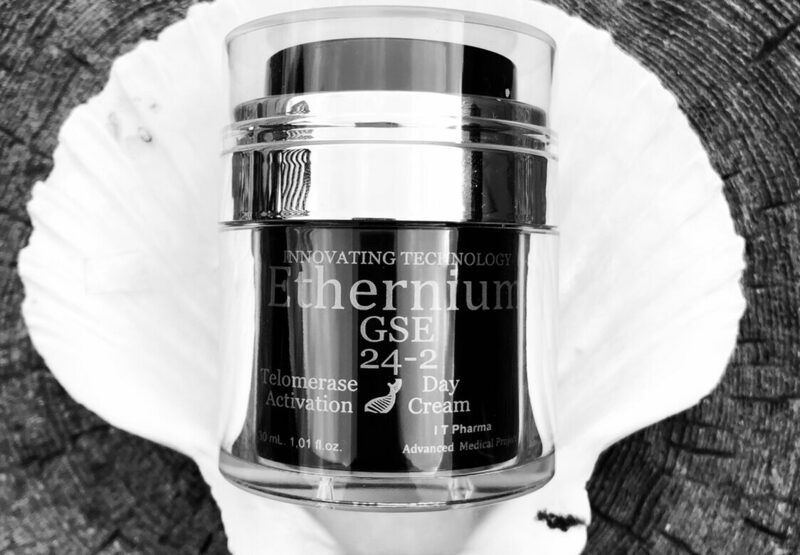 So when I was recently contacted by Pharma Hermetic and invited to trial Ethernium Day Cream I was like: “Sure – why not?” I love a new product. Then I looked at the accompanying literature. They kinda lost me at ‘telomerase activity’…and by ‘cellular senescence’ I was away with the fairies. I tossed the brochure to one side, slapped on the cream and went about my day. After all, the proof of the pudding is in the eating, right? But then, over the course of the next two weeks, my skin started to look…different. More even-toned – and smoother. The hormonal rash on my chin disappeared. I switched my usual foundation for a much lighter BB cream – something I’ve never done before. Pharma Hermetic is a Spanish company with over 30 years of experience in issues related to herbal medicine and beauty, using medical innovation to create cutting-edge cosmetics. Their claim? Science that beautifies. The Ethernium SP-55 collection is a patented range of anti-ageing products based on the peptide SP-55. What is a peptide, I hear you cry? (Or is that just me?) And do we even care? (Also me.) Well, a peptide is a short chain of amino acids. Peptide SP-55® consists of 55 amino acids which help the stem cells in the skin to increase telomerase activity naturally and improve cell telomeres, thereby delaying the ageing process which affects the skin and allowing it to recover. The strapline ‘Eternity is closer than ever’ sounds a bit strong, but I’m willing to give anything a try to slow down the effects of the ravages of time on my face. The scientists over at IT Pharma are using this peptide thingy in their products to help repair damage to the DNA. So as well as this peptide SP-55 fella, what else is in the cream? Well, other key ingredients include TGFbeta, which helps cell repair and generation of collagen, Vinis Vinifera (grape) Seed oil (grape-derived products, such as, erm, wine, are always fine by me – bring them on! ), sodium hyaluronate (that essential ingredient for any serious anti-ageing product) and plenty of antioxidant vitamins C and E.
Get it? I think I do. Sort of. The product certainly has kerb-appeal, with sleek silver and black packaging, plus an innovative pump which hygienically dispenses just the right amount of product. Personally, I don’t like bacteria-laden fingertips dipping in and out of tubs of expensive lotions and potions (or should I say curious partner’s bacteria-laden fingertips); preferring my products to be in tubes or pump dispensers. This dispensing method is both hygienic and aesthetically-pleasing – the only downside is that you can’t see how much of the product you have left. The texture is smooth and easily absorbed, provided you don’t apply too much product; the amount dispensed in one full pump is easily enough for the face, neck and decolleté. (Use too much and it emulsifies; the more you massage the less quickly it absorbs.) The fragrance is minimal, and you can apply makeup straight away. Both of these features score Brownie points with me. For the first few days I find the product pleasant to use, but I don’t see any real difference. Hardly surprising – skincare really needs at least 30 days of continual use to see a marked difference, since this is the life cycle of an average skin cell. However, after 10 days of continual twice-daily application my skin looks smoother; more refined and definitely more even-toned. After two weeks I even go out with no base on my face at all. Think that’s minor? Well seeing as I’ve barely had a bare-faced day since I was a teenager, this is actually a big deal for self-conscious old moi. I don’t even pop for a pint of milk without a full face of maquillage. The recommendation is three months of continuous use to really see the full effects. I have only been trialling the day cream, but the recommendation is to use the cream in the morning and the serum overnight. In the clinical trials 99% of patients achieved a satisfactory reduction in wrinkle depth and width, with a reduction of 85% in almost all cases after 18 months’ continual use of the day cream and serum. Impressive stuff! Listen, we all know that short of a magic wand, nothing is going to reverse the ageing process. ‘Miracle creams’ are just that – about as believable as that Bible story about turning water into wine. Frankly, I ain’t buying it. (I mean the story – if you could buy water that turned into wine, I would definitely be queueing up in Tesco’s for that shiz!). I’m still none the wiser as to how this stuff works its magic…but I don’t care. As long as it makes my face look slightly less likely to scare small children in the street, then I’m slap-happy – on it goes. So I’ll be leaving the science to the geeks who paid attention in chemistry class, applying my creams and potions and focusing my attention on the more important things in life…like a nice long bath with a glass of something cold and a boxset binge. Bliss! To find out more go to www.etherniumworld.com. I am not affiliated with IT Pharma or Pharmahermetic in any way. I was simply gifted the product in exchange for an honest review.